Ever wonder how you can run two different OS (Operating Systems) simultaneously on smartphone devices? You may have already seen it in PC environment and guess what, VMware has plan to bring the Virtualization technology into mobile platform soon. 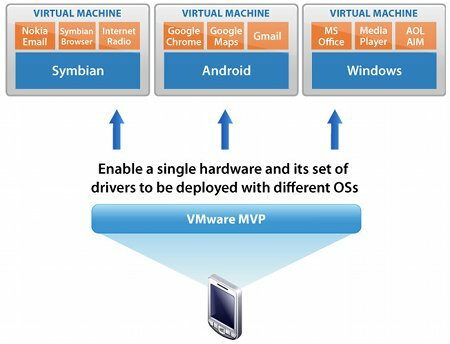 Named as MVP (Mobile Virtualization Platform), it allows mobile users to have two OS (such as Windows Mobile and Android) running in any ARM based smartphones in short future. The benefit is obvious, users will now able to run few ‘partitioned’ OS in different virtual machine on a single hardware platform. For instances, you can now have an enterprise grade OS with confidential files, emails and VPN while on the other hand, you can boot a separate OS with personal music, emails and data with both of them switchable with a single push of button without the need to carry multiple phones. As some may think that it could probably too heavy and consume much of the RAM space but surprisingly, the whole Mobile virtualization solution with two OS could reside in as little as 256MB of RAM space for a much efficient daily tasks. VMware is said to have selected major carriers in both US and Europe countries to start beta testing using prototype smartphones by 2011. However, you may have to wait until 2012 before the actual end products are available for commercial market.